This is the first step of the big art marathon across Russia and abroad, it started the 3 March 2015. 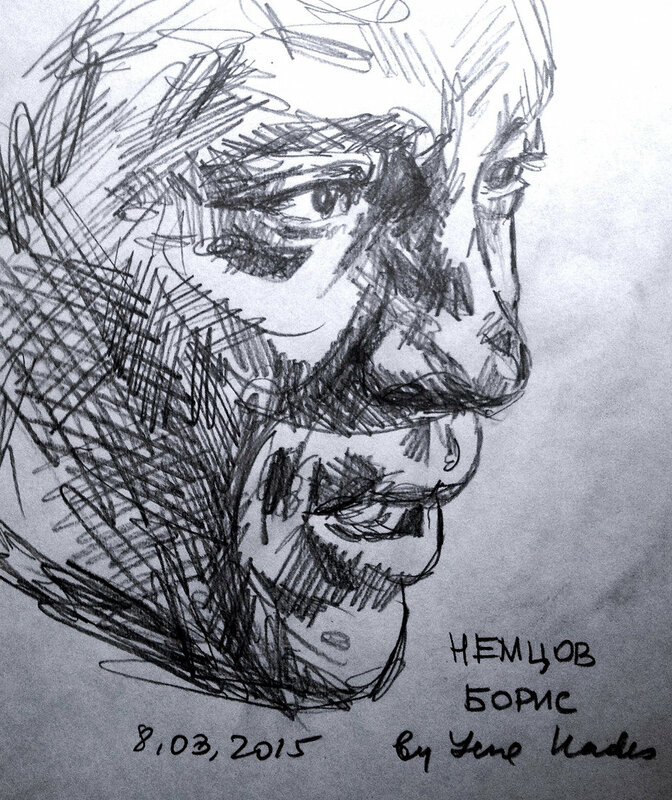 Recently you can see here other Nemtsov portraits made by other artists and non-artists too. The goal of the art marathon is to keep the memory of Boris Nemtsov, man and politician with a big heart, intelligence and honesty. 1. “Рисую портреты, слушаю его интервью и речи на митингах и понимаю – мы 2 сапога пара”, – сказала Лена Хейдиз “Белорусскому партизану”. 2. РЕБЯТА! ВЫ СУПЕР МОЛОДЦЫ!!!! ОБАЛДЕННЫЕ ПОРТРЕТЫ ВЕЛИКОГО ЧЕЛОВЕКА!!!! 4. Лена Хейдиз описывает вполне типичную историю, ведь с подобным столкнется рано или поздно всякий..
5 Openrussia, 22 March 2015, “My struggle and the Russian opposition movement” (in Russian) by Nicholas Podosokorsky. 7. Radio Liberty, 27 March 2015, “Deceased Minotaur” by Andrey Shary. 9. OLAYLAR, 28 March 2015, Bir aydır, dayanmadan Nemtsovun portretlərini çəkir.